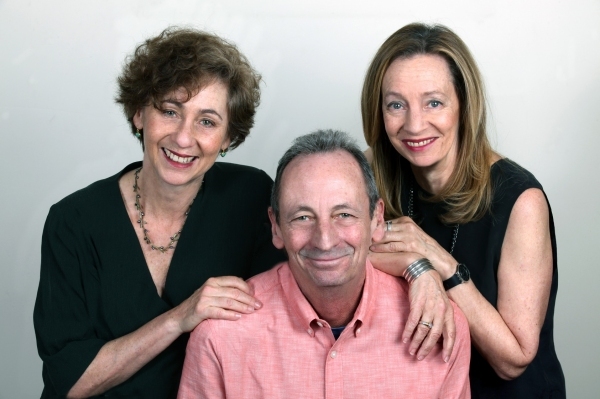 Jamie, Alexander, and Nina are taking you around the globe, celebrating their father’s legacy with you and adoring fans at thousands of Bernstein Centennial events. 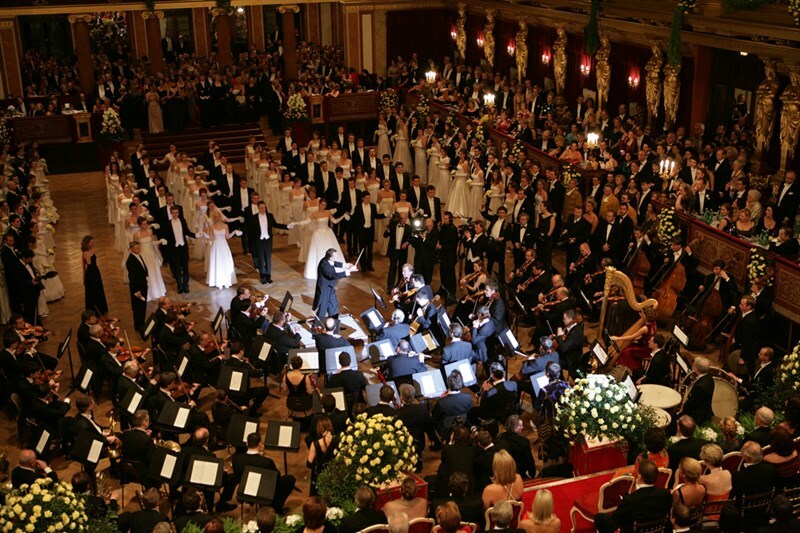 This post, from Nina Bernstein Simmons, LB’s youngest daughter, describes her adventures in Austria attending the gala ball of her father’s beloved Vienna Philharmonic — and reminiscing with musicians at the photo exhibit the night before. Austrians really know how to throw a party. No half-measures for them. The fun began Wednesday evening with a photo exhibit of my father on an upper floor of the Musikverein. These were photos from his years with the Vienna Philharmonic, beginning in 1966 when their “great love affair” began. One photo in particular had been blown up beyond life-size. In it, Leonard Bernstein (LB) is in one of his ecstasies. To my amazement, mezzo-soprano Christa Ludwig was there! Ninety years old — and in full possession of her marbles — she remembered everything, even Bacall’s performance at the 70th birthday celebration at Tanglewood. Christa also remembered my sister Jamie’s “7-Oh Stomp” — as performed by our family quartet. But, in her recollection, we didn’t sing. I suggested that maybe she didn’t remember it because we sang a capella? Well, maybe not what she calls music? After the exhibit, we were invited to peek at the debutantes (hereafter, the Debs) rehearsing their dance routines for the following evening. Even for rehearsal, the girls wore white! (Apparently, this helps keep the lines straight.) They had been at dancing school since September, learning the Quadrille, Polonaise, and other traditional “opening” dances which involve much bowing, curtseying, and other 19th-century gestures. They dispatched each with precision — and without a single giggle. Thursday, January 18, 2018: The Ball! Flash forward twenty-four hours: time to go to the ball! My cousin, Michael, looking beyond dashing in his “frack” (white-tie and tails), picked me up at my hotel and away we went. The first order of business was a dinner held in the Bösendorfer room on a lower floor of the Musikverein. Ordinarily, I was told, the room is full of pianos. Now, there were several tables elegantly laid for a multi-course dinner. We sat with two charming members of the Philharmonic’s violin section, one of whom was married to a woman from Boston. That greased the conversational wheels considerably. We chatted, ate, and drank like old friends. Between courses, two other violinists from the orchestra played delicious little pieces by Schubert and Strauss. We were furnished with (more) champagne while we awaited instructions on our grand entrance to the ball. Now it was time to ogle the milling crowd: as expected, the ladies were exquisitely turned out. One, dazzling in royal blue velvet, even sported a real tiara and a long white fur stole. As for the gentlemen, all wore the required “frack” and some dignitaries wore medals and sashes reminiscent of WW I era aristocracy. One gentleman introduced himself to me, saying that he had studied with LB at the Schleswig-Holstein Festival back in the 80’s. I asked if he was now in the orchestra? “I’m the President of Parliament,” he replied. At the very front of the procession, Placido was paired up with Richard Strauss’s great-granddaughter, Madeleine. For reasons I never learned, Michael and I were separated and assigned other escorts. I was paired with a pleasant gentleman I had never met before; we were second in line. People sorted themselves out behind us. A number of men dressed in livery, looking like supernumeraries from a production of Figaro, opened the doorway to he main hall. A powerful fanfare announced the arrival of the VIPs (us!) and slowly we marched through the middle of the hall, flanked by the Debs in long white dresses, kneeling and steadied by their partners. Other ball attendees watched from the upper tiers. This was as close to an out-of-body experience as I’ve ever had. We took our places on chairs arrayed onstage. (For the ball, all orchestra level seating is removed. This becomes the arena for the Philharmonic orchestra and dancers.) The Debs now took the floor and held one another’s hands up high – holding the position (how?) — throughout the Philharmonic’s performance of Léhar’s Waltzerfolge and the Divertimento Waltz. The Figaro supernumeraries formed a cordon around the Debs and pushed them back to reveal a large panel in the floor. A commanding gentleman stomped ceremoniously three times on the panel at which signal it opened. Several gentlemen lifted it off and took it some paces away. At this time, all the Philharmonic’s instruments were lowered one by one into the pit below, even the timpani. The panel was replaced and that was the last we saw or heard of the Vienna Philharmonic for the rest of the evening. That portion of the evening completed, we were now invited upstairs to the second tier where a table with (more) champagne awaited us. A swing band was playing now and regular ball-attendees took the floor. Michael and I waited until the Debs orchestra took its turn so we could waltz. This went remarkably well, considering the staggering number of spinning bodies. Still, we didn’t want to press our luck so we went exploring. Downstairs, below the orchestra level, guests were enjoying a whole other experience with various bars and concessions, plus a room where singers and musicians performed traditional Austrian folk-opera. It was drawing near midnight: time to head back upstairs to watch the Quadrille! We had already seen the Quadrille as performed by the Debs. Now, it was time for “regular people” to give it a try. I imagine that a good number of former Debs were down there (I heard that many of them went to their former dancing schools for refreshers) plus spirited guests who were determined to give it a good Austrian try. I will not try to describe this dance except to say that it resembles an extremely formal square dance with eight separate permutations, each lasting about five minutes. After each permutation, dancers can gallopp. This means that the couple extends joined hands tango-style and, well, gallops up the row and back as fast as they can. There is probably rhyme and reason to who gets to gallopp and when. We were invited down to the Bösendorfer room once again for sausages and wine. (Uncle!!) Flowers were presented to several of us and all was, as before, delightful. But I had to make my goodbyes as I would be up at 7 to head to the airport. Call me what you will, but I need at least a few hours sleep. Real die-hards stay until 5 AM. I salute them. Thank you, Vienna. What a wonderful tribute. Nina Bernstein Simmons is Leonard Bernstein’s youngest daughter. After several years working as an actress, initially at the American Repertory Theatre in Cambridge, she turned her attention to tending her late father’s legacy. In the earliest days of the internet, she worked with the Library of Congress on making the Bernstein Archives digitally available to the public. The fruits of that collaboration can be seen at the Library’s American Memory website. From 2000 until 2005, Nina worked on a film about her sister, Jamie, and her remarkable journeys around the world bringing Bernstein’s music and teaching legacy to new audiences. Leonard Bernstein: A Total Embrace premiered in Germany in December of 2005. Since 2008, Nina has been working as a food educator in underserved communities.